Come on. What are the first thoughts that come pop into your head? Well, if you are (were) like me, those exact same words that popped into your head surely popped into mine. Let’s be honest here. Have you ever used fake flowers before? Until recently, I had never dreamed of ever using artificial flowers. I thought that that the concept was awful. Why the leap over the side? For me, I needed to have flowers out for an entire month that looked bright and fresh. I couldn’t be at the flower market everyday (nor could I afford them) nor constantly making sure that they looked perfect. I was shocked by how realistic the flowers looked. Comment after comment of how beautiful the flowers were. I have to say some people had no clue at all. People raved about them. They touched them and still thought that they were real? Was it because they just looked THAT good? Or was it that you wouldn’t expect that I would use fake flowers? I have to say that I really loved it when people reached down for a smell and they would comment: “Oh, they smell so good”. It was hard to not want to laugh. Perhaps they really were some of the best fake flowers that I have ever seen? I never thought that I would be ever writing to this or admitting this secret. Would you put fake flowers in your house? Or maybe you already do. Tell me why. I am not sure if this has officially converted me. I don’t think that I am ever going to give up my love of freshly cut flowers. Maybe I will use them again someday. It’s great to know that options out there exist. It has been raining like mad here in San Francisco. So to brighten things up, I will gladly send one happy reader a bouquet of these lovely bright pink peonies. Just leave a comment and tell me your thoughts. One random winner will be selected on June 10th. Good luck! I would put them in my home if they looked like that. I've been known to put a large group of carnations out because I really wanted fresh flower but was trying not to spend too much. It's definitely a weakness of mine. Those peonies look real in the photos that's for sure. I probably wouldn't use fake flowers in my house because fresh flowers are such a luxury, and I really do want them to add life and scent to the space. I also like the fact that fresh flowers don't last too long and need to be replaced. It allows for lots of variety. However, for a situation like your show house they seem like a great idea. Or for attaching to a gift, wearing in your hair, etc. I'm not sure I would use them. (I'm writing this with a vase of peonies cut from my garden next to me) However, I love peonies and if that many people thought they were real, I'd give them a try! I might also use them to brighten my bedroom in February, when everything is so blah and I long for a hint of spring! Thanks for the opportunity! While I love real flowers and get way too much of the artificial foliage here in the midwest (lots of ivy above the kitchen cabinets and such), I would not be opposed to fake flowers that look so real they fool me. Those peonies definitely fooled me. I think they look beautiful in the blue and white containers. I prefer the real deal to fake but I might change my mind if the flowers were so convincing they even smell real!! My first thought is to be horrified as well, but those do look good. Like paperjunk, I've used carnations before. They really have a bad rap. Just use all one color. But back to your question...My fear of using fake flowers for any amount of time is that they would get dusty. Is there anything sadder than a dusty flower? But, it looks like the artificial flower manufacturing technology is better than it was when I came of age in the 70's and 80's, so I would say that I would consider it. Thanks for the post! I think they look amazing in the photos, if you had not revealed they were "fake", I would never have known. Think they were a great idea for the showhouse. I'd definitely give them a whirl in my home----as for the "smell', guess it just shows: you gotta believe! I love fake flowers, but they have to be top, top quality. In the old days they looked so plastic, but now, being silk, they can look wonderful. Here in the UK we have a fabulous company called Bloom and we get lots of flowers from them. They are expensive but really worth it. We have real plants and flowers dotted around the house too and I think that works. I have used fake flowers mixed with real flowers and real greenery! Fools everyone all the time! I do alot of parties and mixing real with fake works for our hot, hot Texas sun. Plus, living so far south, we don't have a flower market available. So the use of great fakes (I stress great)works. No shame here--in many cases the fakes cost alot more than the real deal. I dont use them as the main flower, but to mix in and add fullness---it works!! I knew your flowers were faux - but then again, my fakes are sold at Neiman Marcus so I know good artificials when I see them! I have to say that even after 13 years of creating the most beautiful, realistic artificial floral bouquets and orchids, we still get calls from designers who say they would NEVER consider using fakes... until they see ours. I'm happy to hear you've been converted and hope you will take the time to see what we do; I'm sure you'll be surprised at how amazing faux flowers can be. P.S. It was a pleasure to meet Karen in NY last month at the Elle Decor showhouse. I was won over by stems of orchids at Island View Nursery in Carpinteria. I asked the clerk how much the cut orchids were. I was gobsmacked she she showed me they were artificial. I would never have believed I'd recommend them! They are great for people who have second homes, they don't have to worry about caring for them when they are away! I have been tempted but haven't yet. I have used them for my store windows. They are gorgeous flowers. Normally faux flowers do not live in my home. The quality of these pink peonies is really wonderful. My pink peonies in the garden were ready to burst forth and the rain ruined them. There are fakes... and then there are fakes. I wish I knew who made yours - they're gorgeous! I've tried to entertain the thought of using fake flowers - even Michael Smith does - but I find it difficult to do. For a showhouse, and based on the quality of the blooms as photographed, it seems like a perfect opportunity based on your reasoning. What I'm doing now is buying flowering plants. They last a long time, but do need a watering commitment. It's cheaper than cut flowers in a pinch and with our crazy weather they usually don't suffer from sudden wilting. My two cents! (Also, I think our opinions are skewed due to the overuse of fake plants in the'80s and'90s.) Since your peonies photograph so beautifully, I would try a bunch on my entry hall table. Of course fresh would be my preference, but! In a situation like yours, or for instance--my husband's office where they would have to be changed weekly, it is just not practical. Don't love them, never will. But I do think at times they are a necessary evil! To clarify further--only one bloom en masse--no fake floral "arrangements" they are so....scary. Also, in Louisiana we have no open air flower markets due to a silly and archaic law stating that anyone selling flowers must be a 'licensed florist.' So walking down to the corner and scooping up a pretty bunch of cut stems is not an option. We must purchase through a florist for decent blooms--obviously that can be cost prohibitive. And the grocery stores just don't cut it! (Unless I want fluorescent dyed daisies and leather leaf..gag). I think the secret is in how they are arranged as to whether they look fake or not. Sometimes the greenery that comes on the stem looks more fake than the flower. Just remove it. My secret [no longer] is that I mix real flowers with some stems of fake ones to flush out the arrangement fuller. Nobody has ever noticed. There are brands of silk and fabric flowers made today by very skilled artists, tho pricey, are very hard to tell they are fake. My question to you, have you ever used porcelain flowers? You know as they say " you can fool some of the people some of the time but not all of the people all of the time." For personal use, Only fresh works for me because there is "life" in them, and that is what I seek in my environment. But I do understand their practicality in commercial use and have no problem accepting them in that setting. After all you are selling the "Idea" and not the flowers. Those really are beautiful flowers. I think I would still have to say - "no thanks to fake flowers." I would prefer a bit of greenery cut from the side of the road than flowers that are fake. What a fun topic!!! Hope the rain stops soon. We all fake in life some time, why not fake with fake flowers? The real flowers are not so real as you might think. Flower shops place white flowers overnight in water with colored dye. In the morning you and I go and buy red, orange and purple flowers that were white a day before. I actually got to see your peonies "live" at the Showhouse and they were unbelievably real looking! I heard lots of people commenting on how beautiful they were (although I didn't see anyone smell them ; )!). I loved the unexpected combination of them with the formal urns as well as how they provided just the right amount of pink pop in the space! I would definitnely use them! My sister and I just recently had a fake flower "intervention" with my mom...but her flowers were not nearly as beautiful as the ones you used. If her flowers looked that good I'd say use them in every room! Absolutely, positively hate fake flowers. Yes, those are strong words, but it's true! There's never an excuse to use them-- succulents or orchids are a fantastic alternative to cut flowers if one wants to stretch the budget. I've been toying with the idea myself. If they're so great you can't tell the difference, I'd definitely do it! It just gets so darn expensive buying fresh flowers all the time. I"ve been trying to grow more flowers in the garden that look great in the house too...except I'm so proud of myself for growing it that I find it difficult to cut!! What's a girl to do? Fake flowers, lol funny. But I have heard rumors about fakes that look fantastic (and yours DO! ), and my mother in law uses a gorgeous fake orchid stem with her real orchid leaves b/c the leaves refuse to re-flower. I can't tell the difference. In my home, I try to buy flowers that last a long time... orchids from the farmers market are a favorite b/c they're economical and last for ages. If I had fake, but fantastic-looking, peonies, I'd put them on the dining room table and see how many people I could fake out! I'd probably even re-arrange them occasionally -- different vases, different #s/vase, etc... I don't think anyone would guess they were fake b/c that's not my style. Hmm,I have nothing against them in the right location. I can see reasons both for and against them. I think they actually might be ideal for a dining room table as no scent would overpower or compete with the food. Those peonies look much better than what I think of when I think fake flowers - like the dollar store ones that cry out to be glue-gunned to a straw hat. So glad you outed this; I share your sentiments -- amazing myself when I've chosen fakes. Even when they look good, the whole while I'm uneasy about it. I feel like I'm cheating. What I know: if I sit down to a beautifully prepared table, I'm disappointed if fresh flowers aren't included. I'm really bothered by fakes there. Is it because someone has labored to prepare fresh food? Fresh food deserves fresh flowers? It feels incongruous to experience fresh food alongside fake flowers even when both are beautiful. Terra cotta flower pots vs. foam, same dilemma. At least for me. Others don't get me here. I can't help it when I know regardless if you don't. After all, we have one life this time, as my Sufi teacher once said. Final thoughts. There is a time and place for both. Everyone has a different life experience. Make yourself happy. Fakes can look great; real is better. We can celebrate we have such issues of little consequence. Thanks for a bright spot in our world, Grant. I have used fake flowers before but only because I don't know how best to make cut flowers last. (I have a hard time keeping house plants alive.) I prefer, however, fresh cut flowers and live plants. I must admit that I have been fooled by some very realistic-looking flowers & plants. An ex boyfriends mother (in London) actually put fake flowers in her garden so that there would be colour in the winter ( they were not the quality faux you describe)! I was lost for words when she told me about her "brilliant" idea! I think fake is preferable to dried ever since someone ask why I would want dead flowers in my house! Hmmm! Maybe your next blog topic? Albert Hadley had a fake tree in his cottage here in Naples, it looked so real. the real ones cost a LOT more...also David Easton had fake topiary trees in his NYC loft apartment...it seems that all of the rules have changed regarding flowers, due to FINANCES!!! Good for you for being brave enough to admit your "sin"! Your showhouse room is a killer tour de force! Where I live we don't have those wonderful flower markets found in Portland, SF and NY. There are many months that the only thing I have access to are hot house roses and such. Fabulous fakes and even not so fabulous ones are better than perfectly uniform florist selections. Your peonies looked wonderful in that incredible room. I have seen rooms in designer magazines and blogs where an unusual flower or plant is the most interesting thing in the picture, but they never tell what that striking orchid or dahlia is called. Am I the only one who wants to know the name? Hello and thank you for posing the question re; "Fake flowers." However, my dear husband was diagnosed with cancer and Dr.'s orders..."No fresh flowers, plants, fresh fruits/vegs should be in your home...they pose threat of infection, etc." The void was depressing...enter fabulous fake flowers from nearby Roger's Gardens in Newport Beach. Like you, I recieved oodles of compliments on my "fresh" flowers..."Lord, let my words be tender and sweet, that some day I may need to eat them." "Fake flowers" have their place but they must be very well made... unlike those in a dollar store! That said, the aesthetic of an arrangement or a bouquet, or just a single stem, is so gratifying for me that I would almost never resort to artificial flowers. Keep up the great blogging !! dust-free, rotate them with the seasons, and let them brighten your life! OMG. This post is so funny. Speaking of faking it, a story I wrote on your fave trompe l'oeil master, Ms. Jacobus, is running in the Chron this coming Sunday, barring any breaking style stories that would cause delay. Just one word: ALLERGIES! Beautiful silk flowers provide a perfect alternative when real flowers provoke an allergic reaction yet one wants the graciousness of a floral arrangement. Thanks for providing a much needed endorsement for this ideal solution. And yes, your arrangments were so life like it was impossible to know your secret. You did the right thing...while real flowers are the best, they are cost prohibitive sometimes. Your flowers are gorgeous and I was working at the showcase and admired them every time I walked by. I was surprised they weren't real...great solution! I would use them if they looked like that, and if that bloom were in season. No matter how terrific they look, if you use flowers out of season people just know you didn't spend that kind of money at the market for fresh flowers daily, ya know what I mean? Unless, of course, you have that kind of money. I am a passionate gardener, but my heart has been stolen by trees and shrubs—woody plants—that offer texture and form for every season. That does not leave much space/light for flowers. I have been a snob. I may now be a convert. What are your sources for great fakes? Thank you for such an honest post. There are a lot of us who have no source for fresh flowers daily, even if we could afford them, so yes, fake flowers do come into our homes, offices and lives. I have found sources for extremely life-like flowers and use them for special occasions and as a treat or pop of color whenever I like. It's nice to see someone such as you say it's okay, and even a great way to dress up our homes. Your peonies are awesome! As for the person who thought they smelled lovely, maybe it was the power of suggestion and that she never thought you would use fake flowers. Thanks for the chance to win a beautiful bouquet. All things just keep getting better even faking it. We are such a visual society and I think it's a good thing. Because sometimes you have to fake it to make it through. Don't mind if you do. Whatever gets the job done! That is what I say. I, too would be horrified, to have them in my home or use for a client, BUT for a showhouse? Why not? Peonies are my favorite flower and they DO photography perfectly. Of course, what I WANT to know is.......WHERE DID YOU FIND THEM? Thanks for sharing all your beautiful, creative work with us out here in blogsville. I agree Grant! I was hesitant at first, but fake flowers have come a LONG way from what they used to be. I think for special occasions or days that you just need a little pick me up, the real deal is obviously the way to go; but for certain uses and some everyday use, fake flowers can work! Well, Grant, I can't tell you how much I enjoyed your article on "fake" flowers!! I absolutely adore flowers, but it isn't always possible to fill your home with fresh ones. Since I started my silk flower business, I will mix silk bouquets in with real ones in my home, and people always assume they are all real. I even had a houskeeper water a silk arrangement. Please check my web site :www.sophiedahydesigns.com. I don't have time to refresh flowers every few days, so I would use in a heartbeat in a less-frequented spot that can use some brightening. But where on earth did you find great fake flowers?? As one of the docents, I spend many hours in all of the Showcase rooms. I did not realize that the peonies were silk, even though I pointed out the Chinese export blue and white pottery many times! 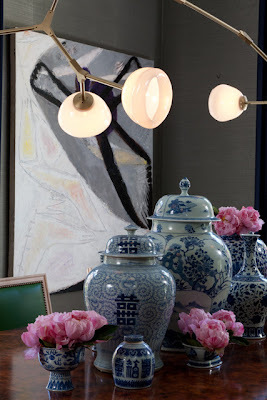 Along with the stenciled floor, faux burl table, grosgrain trim on the draperies and the mid-century light fixture! Well done! I think you're right about the fact that no one would expect it, so you can get away with it (especially when they look THIS real). Even a posh lady can get away with a fake diamond now and then, because she wears real ones too. Perhaps everything in moderation is key. Oh my gosh! I have just recently gone through the same experience! was tired of NOT having fresh flowers (in every room, all the time--ha!) and I broke down and bought some fake ones. I use them in my bedroom and they're only seen by me (and husband who couldn't care less) and passers-by on the street. And I change them out all the time, often for palm cuttings or bougainvillea from the garden. This experience made me wonder how many others there are out there :), and even how many fake blooms might be used by stylists for photo shoots that I have assumed to be real. Fake Flowers at Showcase??? NO! I was sure they were real! Ok Geri should win the peonies as they are her favorite flower and she just had all that stuff with her nasty, ruptured appendix. I loved your idea of using fake flowers in the showcase because they were so beautiful. I among other people was fooled too and tried to smell them. I am still not sure about using them at home. I know I'd look at them 100 times a day and think "They are not real flowers". Yeah, I know, it sounds like ADD symptoms. Fresh flowers are the best alternative. But sometimes, the budget for some people cannot accommodate them. In this case, there are REALLY great and amazing "fakes". The best can be expensive but you only have to buying them once! You had me fooled....the flowers look great and YES I would absolutely use them! Thanks for all your interesting blogs. Congrats to Andrea Vernon for being the winner! Thanks everyone for all of your thoughts on this. I believe that it is a trade only source. Honestly, I was pretty shocked myself when I opened up the box. I didn't know what to expect. I was happy that it worked out. Most people didn't notice. But you can't fool everyone, it seems! If it's real vs fake - real wins out every time. In certain situations fake can be great. I think that fake flowers, silk or otherwise have become their own mode of artistic creativity - its just another layer of art form added to a room. As you discovered they look so real, and apparently they smell too. It's amazing the amount of detail that's put into the really good ones that pass for real. 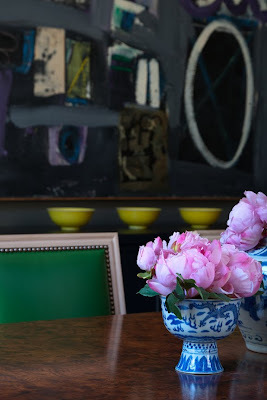 I also love the ceramic flowers that Carolyne Roehm is a big fan of. Wish we could come up with an alternative word for "fake" though, here's a thought - fabricated. A friend of mine used beautiful paper flowers. They resembled nature, only translated by the hand of man. A poor man's version of 18th century porcelain flowers. They were so chic and terribly elegant. Look at page 154 of the June World of Interiors! Beautiful crepe paper flowers and fruits!! Grant - I was with you! But, I agree that in certain situations GREAT looking fake flowers do the trick. They are perfect for 2nd homes that are infrequently visited. You can arrive and be greeted by a burst of color! There is a time and a place for fake flowers..and even fake plants for that ,atter..if they were like the fiddle leaf fig branches in a vase that I just saw then I'd use them. I think you just have to be very particular. Nothing beats fresh but I too am not willing to forgo the nice color and shape they bring to a room and since I too can not go to the flower market ever few days then I totally get the fake flower thing. I am laughing at people commenting at how good your fake peonies smelled. I actualy have grown an appreciation for fake flowers over the past few years. The realistic qualities company produce is incredibly real! I use them for vases that are in hard to maintain places. Above the kitchen cupboard, or in a unique vase that requires a lot of maintenance for placing real flowers, so I use a really good quality fake orchid. It even has water droplets! I think they are great addition. Not fill the entire room, but to help accent the room. Definitely a plus! Loved this post! I have participated in a few showhouses and keeping fresh flowers in a room for a month can become a full time job. I am just designing a room for an upcoming showhouse in Greenwich CT. again I thought of the flowers. I just returned from Paris on Friday and there is a shop called Sia, at first I thought the shop had fresh flowers and realized they were all fake they were that GOOD. I am not a fan of fake trees but the way you had the pink with the blue you would never know they were fake...love it...and I will be following in your footsteps!